Why is it so Hard for Policy Makers to Separate Access from Affordability? New Orleans Life, work, and the world are full of mysteries, but after years of hitting my head against various walls, I’m finally connecting the dots in trying to understand the peculiar responses we sometimes get in trying to change public policies and private pricing strategies. Remittances are a prime example. Talking last week to a professor who teaches a course at a local university on personal finances, she was excited when I told her about ACORN’s Remittance Justice Campaign, because she wanted her students to understand the complicated world of money transfer systems. When she understood the topline demand of our campaign was to cap the pricing at 5% to stop remittance costs from being so predatory, her face almost deflated. Of course she supported our position, don’t get me wrong, but affordability had not occurred to her as an issue in the way that it is of course paramount to immigrant families and migrant workers trying to send money home to relatives and communities in their home countries. …the organization released a report summarizing 400 testimonials from low-income Canadians about how vital yet unaffordable home internet is. A recent CRTC survey suggests that many Canadians think home internet is essential, but too pricey. Half of the survey’s 29,000 respondents are dissatisfied with the price of their internet service. 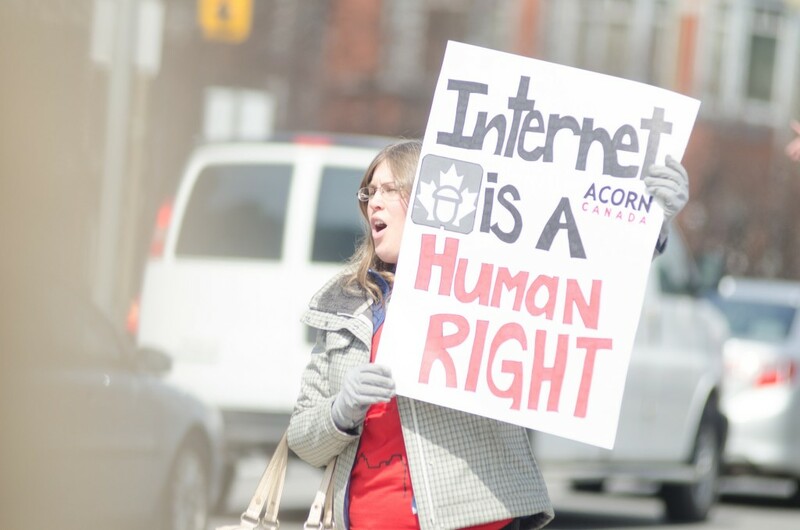 ACORN Canada members view affordable access to the internet as essential to improving low-income Canadians’ ability to succeed in the digital economy. The same dilemma was faced by the FCC in the United States and, as we recently discussed, and the FCC duck walked around the issue by subsidizing the cost of internet ostensibly for lower income families by around $10 per month, rather than tackling head on the fact that affordability is the barrier to access, rather than availability of the internet. This is an old saw. In the housing collapse from 2007, the supposed “reform” was trying to force lenders, many of whom were overtly predatory in the subprime mortgage field, to have to assure the loan was affordable to the family before issuing the money. When they were just churning loans, there was more than enough access to mortgage lending capital, but whether it was affordable within an honest reckoning of family income was a diminished factor in pumping air into the bubble. Why do policy makers refuse to routinely address the issue of affordability when dealing with the question of access of services and implementation of programs? This is where the divide of experience between the one-percenters and big whoops from the rest of us and especially from low-and-middle income families becomes so pronounced and creates such tragic results. They just don’t get it, and too often these days, seem unwilling to do the “homework” and listening to understand the issues from any other point of view, especially from the perspective of our people. Simple suggestion: consider affordability first, and access later down the list. Make stuff work by understanding that pricing pushes people as a primary concern. This entry was posted in ACORN, ACORN International, canada, Citizen Wealth, Financial Justice, Ideas and Issues, Remittances and tagged FCC, Internet access by Wade. Bookmark the permalink.